Do South Florida Mayors Do Anything? WLRN producer Elaine Chen chats with WLRN anchor Marva Hinton about the If I Were Mayor project. Has South Florida had any good mayors? 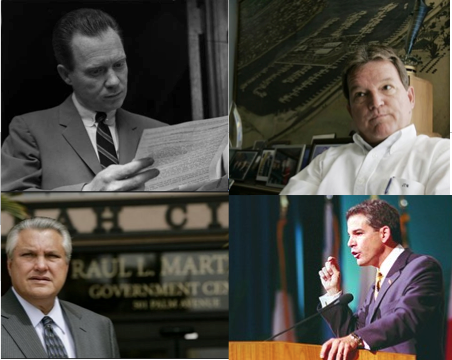 Some of suggestions from our audience, clockwise from top left, Robert King High, mayor of Miami (1956-1967); Jim Naugle, mayor of Fort Lauderdale (1991-2009); Alex Penelas, mayor of Miami-Dade County (1996-2004) and Raul Martinez, mayor of Hialeah (1981-2005). 1. People are thinking big. From new, east-west train routes to more edible landscaping and higher educational standards, South Floridians have clear visions of what they’d like to see in their towns. 2. The powers of local government are confusing and far more limited than the ambitious visions of their citizens. As it turns out, it’s not always easy to figure out who is in charge of your community. Take the roads for example – some streets are maintained by the state, some by the county and some by the city. So far, there is no readily available map or mobile app that spells out who maintains which roadway. Schools? You could generally assign those responsibilities to the county school board, but in some cases, like in Cutler Bay, the towns help fund them as well. Parks? Well, it depends. Some parks belong to the county, some to the city or town. Having the responsibility for local services split between a county and a town is common in most parts of the United States. Some exceptions are San Francisco, New York City, Baltimore, most of New England and Virginia, where there’s only one local government. And in most major U.S. cities, the local government is headed by a strong mayor. Most of South Florida’s local governments are council-manager systems. Notice that there’s no “mayor” in that description. Mayors here are mostly figureheads with no executive power: they don’t hire the heads of agencies nor do they have veto powers. It’s the city manager who oversees the agencies and is in charge of a town’s day-to-day operations. That city manager is usually appointed by the council, which is the only body that can remove the manager. The caveat here is that each town/county is different, which makes following local issues a challenge for new residents (and reporters). While you may learn how the federal government works in elementary school, you probably learn much less about your local government. Mayors are still the most visible local official, typically because they are elected by the whole town and not a particular district. That visibility, along with the vote of the general population, gives mayors a stronger platform to advocate for policy changes. Robert King High, mayor of Miami from 1956 to 1967, drew attention to illegal practices that were happening on city streets and inefficiencies in city government. Charles Flanagan, mayor of Pembroke Pines from 1972 to 1976 and 1982 to 1995, pushed for the annexation of land that doubled the town’s size and persuaded the county school board to build a high school there. Also, if we had asked -- “What would you do if you were the city manager/city commission/school board/school superintendent and county mayor?” -- it's a good bet that people would have stopped listening before we had even finished asking. So what does all this say about how we chose to organize local government? Tell us what you would do if you were in charge of your town. We're sharing your ideas online and on-air. This project is supported by The Miami Foundation as part of their ongoing work to build a more civically engaged Miami. With several mayoral races underway, WLRN-Miami Herald News wants to know what you would do if you were in charge of your town. The project is called "If I Were Mayor." Send us your ideas on how you'd improve your community and why. Make sure to tell us how that issue affects you personally. We'll be posting your ideas and stories online and sharing some of them on-air. You can also tweet us #IfIWereMayor. Why Doesn't Miami Have A Competitive Mayoral Race? Let's start with a smaller story about wasted words. Barry University political science professor Sean Foreman is editing a collection of articles by big city professors about mayoral campaigns in their own cities.